Last July, a breaking news broke that Kristen Stewart cheated on Rob Pattinson with Snow White and the Huntsman director Rupert Sanders. Kristen is Snow White in the film and with her is Rupert’s wife Liberty Ross as her dear mother. A series of steamy photographs of Kristen and Rupert kissing and hugging appeared at US Weekly and the internet. And within hours Kristen has taken a rather unpopular decision of admitting her “momentary indiscretion” acts. That’s not the story of my post, though. Because of that breaking news, I’ve decided to read the Twilight Saga series I bought a year ago. After all, the Breaking Dawn part 2 movie will be in theaters in four months. That means I only have four months to finish the four books. Sounds pretty unrealistic for someone who works morning to night seven days in a week. Monday to Friday have been devoted to work, children, and home — and that usually starts at 4:30am. Saturdays and Sundays are devoted to the house cleaning, laundry, and ironing plus grocery and market. Honestly, I don’t even watch any television programs because I rather sleep and catch more sleep. Anyway, because I fell in love with Edward in the first book “Twilight”, I find myself becoming so engrossed in the book. I finished reading the whole Twilight series – Twilight, New Moon, Eclipse, and Breaking Dawn – in two months. As mentioned, I enjoyed the first book. I would describe it as a sweet love story which accounted how the two main characters Bella and Edward fell in love. 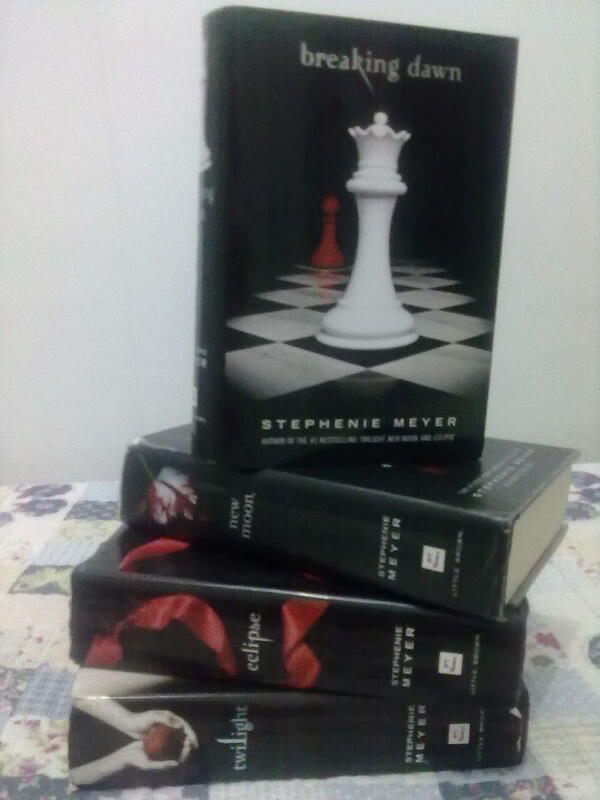 This might not be the best-written book of Stephanie Meyer but still, she did a great job in making those “first love butterflies” feelings. And because I have seen the movie first, I could imagine how Edward moves, talks and looks at Bella. I was hooked after the first book and hurried to finish it to start with the second novel “New Moon.” I didn’t like Jacob’s character, much more the twist it brought to the story. Critics found the third novel “Eclipse” as engaging and romantic. I must say it explored more mature scenes and I personally enjoyed it very much when Bella preferred Edward over Jacob. The novel Breaking Dawn’s ending still didn’t stop me from seeing the movie. Everything seemed to be just like what the book disclosed but nearing the end of the film, I was totally surprised. A twist so different from the book. It described a fight scene -Carlisle and other vampires beheaded, some set on fire, etc – one that could have happened if Aro opted to mess with the Cullens. The scenes were so violent and visually stunning; truly shocking to anyone who has read the book. I for one realized that my jaw was kept open at some point. This was how the director decided to show the fight scene instead of just having Edward narrate it just like in the book. No blood was shed, and the romantic pairings all had a happily ever after. Did I enjoy the book then? I plan to start with my other book collections – Paulo Coello’s. Note: One of those book reviews from Mga Pahina ni Msbolin. Written last November 21, 2012. I love the Twilight Saga. Both books and movies. I don’t care what people say! hahaha I really like Edward and Robert Pattinson playing him was great. When I’m feeling like I need a little reminder that love exists I watch this. I also love Edward. And love Robert Pattinson because of that. Somehow I hate Kristen for breaking his heart. Ehehehe. Affected ako. Oh this Saga! haha! Now we another thing in common – Team Edward! lol! I never read the book but I watched the movies. And if I read this before I watched Breaking Dawn Part 2, I’d be sad if I accidentally read the spoiler! haha. That fight scene really got my heart beating so fast, I almost cried when Carlisle died! haha. I read the entire Twilight saga, I did like it, it was very simple notwithstanding the fact that many people hated it. What I didn’t like though is the movie. It was very cringe worthy. I kinda feel sorry for Kristen Stewart that she got overly criticized because of this role. I remember her from Panic Room with Jodi Foster and she was good in that movie. I don’t know what happened to her in Twilight. Believe me or not. I haven’t even seen 1 of the twilight movies completely. I’ve seen bits & pieces whenever the movie comes on hbo. Somehow the movie never attracted me enough to watch it completely and all the movies.!!! Same story in the case of Harry potter series as well. Haven’t watched the movies or read the books. I think I may be from another planet! Lolz.. I love the twilight saga! I’ve read the books and watched the movies as well! My least favorite part is part 2 (New Moon). And as for the movies: Breaking Dawn part I. I loved part II! I’ve always been team Jacob though haha I liked Jacob way better then Edward. I think the books are very well written. I was never able to stop reading! I know this is unusual but I have not seen the movies yet! I love thrillers and vampire movies and series of course, but I had not the chance so far to catch up with that. In 2017, I would like at least to read the first book! If you are able to find time to pursue your passions while being a mom, then my congratulations.Moms have to cope up with so many things. Things need to be fixed everyday by the moms-husbands, kids, in-laws- everyone wants the moms to do that job, immediately. May you continue to find time to pursue your passion. I remember that last scene. Many of the Volturi’s allies would have been killed if they’d mess with the Cullens. My then GF told me that it was different from the book and the director did a great job on that. I enjoyed the movie as well as the book!